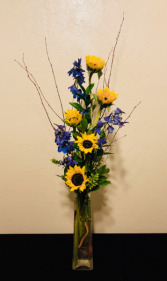 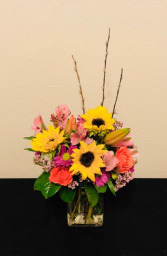 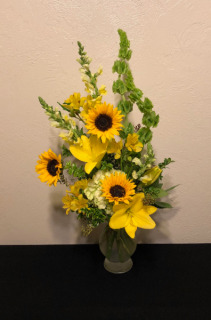 This all yellow and green arrangement features, hydrangea, sunflowers, snapdragons, Bells of Ireland, lilies and alstroemeria. 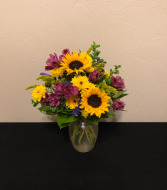 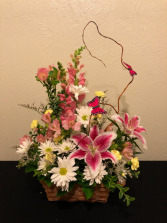 Call the shop at (208)323-7738 to customize your order! 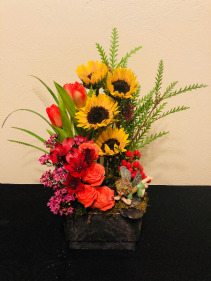 This natural dish garden features assorted seasonal plants in a marbled black container with birch branch and lotus pod accents. 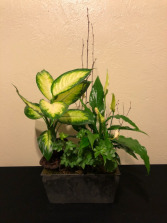 The pictured plants may not be available at time of purchase but all dish gardens will be created with seasonal plants to value. 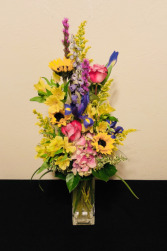 Call the shop at (208)323-7738 to customize your order! 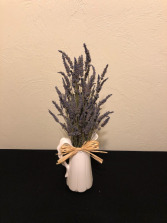 This lovely lavender pitcher features dried lavender, raffia and a keepsake white pitcher. Call the shop at (208)323-7738 to customize your order! 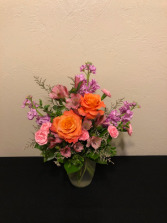 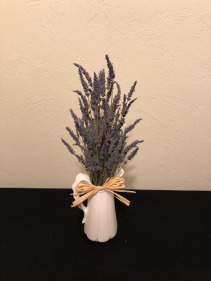 **This picture features dried lavender, but during the summer months it may be available as a fresh arrangement. Call the shop for details.